From the Department of Family Medicine, Oregon Health & Science University, Portland (ED, SF, RER, DY, MM); the Department of Public Health and Preventive Medicine, Division of Biostatistics, Oregon Health & Science University, Portland (MM); and the Department of Medical Informatics & Clinical Epidemiology, Oregon Health & Science University, Portland (BS). Purpose: Internet-based patient portals are increasingly being implemented throughout health care organizations to enhance health and optimize communication between patients and health professionals. The decision to adopt a patient portal requires careful examination of the advantages and disadvantages of implementation. This study aims to investigate 1 proposed advantage of implementation: alleviating some of the clinical workload faced by employees. 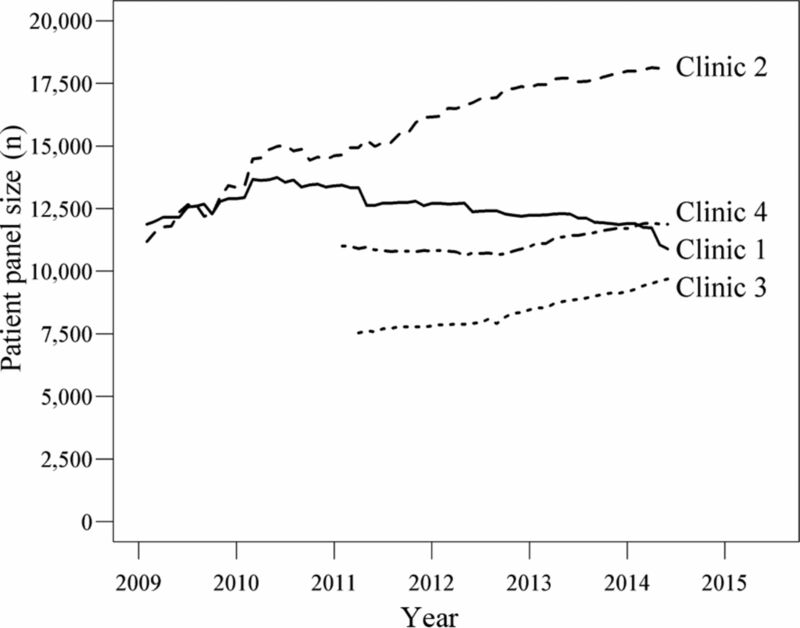 Methods: A retrospective time-series analysis of the correlation between the rate of electronic patient-to-provider messages—a common attribute of Internet-based patient portals—and incoming telephone calls. The rate of electronic messages and incoming telephone calls were monitored from February 2009 to June 2014 at 4 economically diverse clinics (a federally qualified health center, a rural health clinic, a community-based clinic, and a university-based clinic) related to 1 university hospital. Results: All 4 clinics showed an increase in the rate of portal use as measured by electronic patient-to-provider messaging during the study period. Electronic patient-to-provider messaging was significantly positively correlated with incoming telephone calls at 2 of the clinics (r = 0.546, P < .001 and r = 0.543, P < .001). The remaining clinics were not significantly correlated but demonstrated a weak positive correlation (r = 0.098, P = .560 and r = 0.069, P = .671). Conclusions: Implementation and increased use of electronic patient-to-provider messaging was associated with increased use of telephone calls in 2 of the study clinics. While practices are increasingly making the decision of whether to implement a patient portal as part of their system of care, it is important that the motivation behind such a change not be based on the idea that it will alleviate clinical workload. With the governmental push toward electronic health records, as seen with the Health Information Technology for Economic and Clinical Health (also referred to as “Meaningful Use”) provisions of the American Recovery and Reinvestment Act of 2009,1 many practices are expanding their health information technology systems. With this increase in the use of electronic health care records, there is a natural turn toward the utilization of Internet-based patient portals. Internet-based patient portals give patients the possibility of online access to many of the same things that previously required a telephone call or trip to a provider's office. Patients may now send secure E-mails to providers, schedule appointments, and request medication refills.2 Many of the functions provided by these patient portals have the potential to replace tasks that are otherwise left to providers and other health care employees to perform.3 A natural assumption is that this will alleviate some of the workload faced by many health care workers, including lessening the burden of incoming telephone calls. Adoption of Internet-based patient portals does come with potential challenges. Implementation barriers include a lack of infrastructure, reimbursement issues, and changes in staff workload.4 Projected benefits are, however, believed to outweigh the tribulations that come with any major administrative change such as this. While some studies demonstrated reduced telephone utilization with the use of patient portals,5 several other studies observed no difference6⇓–8 or even observed an increase in telephone use.9,10 In an effort to weigh the pros and cons of implementation, this analysis aims to investigate the rate of Internet-based patient portal use as measured by the rate of electronic patient-to-provider messages. It is hypothesized that an increase in the use of electronic patient-to-provider messaging would be significantly correlated with a decrease in incoming patient phone calls among a sample of 4 economically diverse primary care practices in Oregon. The study included 4 outpatient clinics affiliated with a university hospital in Oregon. These 4 clinics have Oregon-equivalent National Committee for Quality Assurance level III patient-centered medical home certification. Care is provided to the patients in the clinic, during hospitalizations at the university hospital, and in nursing home settings. Clinic 1 is a commercial, community-based health center. With about 41,000 visits/year, this clinic serves a “middle-class” community. Clinic 2 is a university-based health center. It has about 50,000 visits/year and serves a broad geographic area. Clinic 3 is a rural health center with about 38,000 visits/year in a bedroom community 25 miles outside of the university hospital, and clinic 4 is a federally qualified health center serving about 56,000 visits/year. The study period ranged from February 2009 to June 2014. Two of the 4 clinics had begun using an Internet-based patient portal in February 2009 (clinics 1 and 2), whereas the remaining clinics began in early 2011 (clinics 3 and 4). The Internet-based patient portal MyChart11 is part of the mobile application and portal products offered by the electronic health care management system Epic.12 MyChart gives patients access to a portion of their medical records used by their physicians and care team within the Epic system. Through MyChart, patients are able to send secure electronic messages to providers, make office visit appointments, pay bills, and access a portion of their medical records and laboratory test results. Portal use was measured by electronic patient-to-physician messaging and was calculated by the number of MyChart messages sent from patients to their provider. MyChart data were obtained directly from each clinic's Epic electronic health record system.13 Each initial message from a patient to a physician was included in the analysis; subsequent reply messages in the same “thread” were disregarded. Incoming calls were defined as those placed during regular business hours to each of the 4 clinics, as measured by the clinics' telephone management systems: the Avaya Call Management System14 and the Aceyus system.15 The sample included calls from all sources that were routed to the administrative staff at the clinic for routine handling. Calls directly to individual lines in the clinics were not included in the sample. Monthly rates for each of these outcomes by clinic were calculated as the number of messages or calls divided by the total number of patients (panel size) at each clinic and were calculated on a monthly basis. Panel size was defined as the number of unique patients who have had a visit with their primary care provider at the provider's clinic within the past 3 years of the current month. The calculation of this rate standardizes portal messages and telephone calls to account for the changing panel size over time. 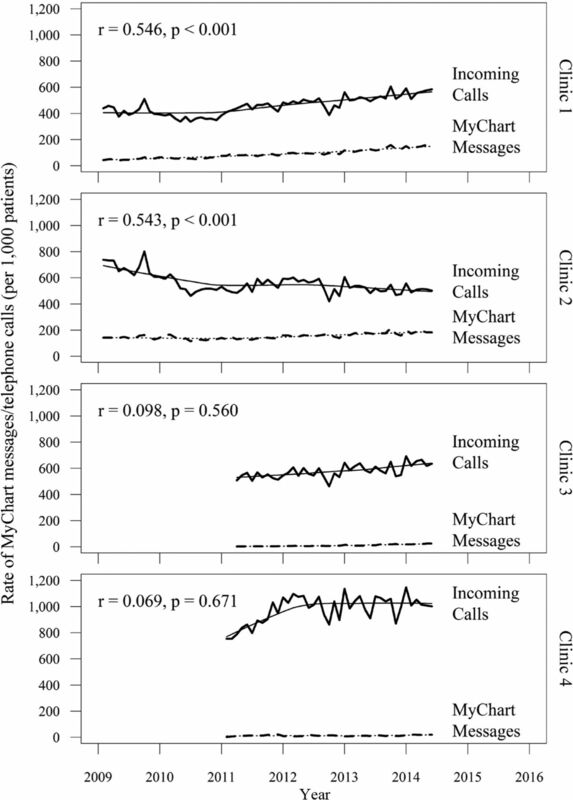 To assess the relationship between MyChart messages and telephone calls over time, a retrospective time-series analysis of the correlation between the rate of MyChart messages and incoming telephone calls was performed for each clinic. Consecutive monthly differences for both MyChart messages per 1000 patients and telephone calls per 1000 patients were calculated. The Spearman correlation coefficients of these differences were used to assess the relationship between changes in MyChart messages and incoming telephone calls over time. This approach evaluates whether any changes between a month with an increase in MyChart messages from the month before would produce a proportional decrease in the number of telephone calls (negative correlation) or an increase in the number of telephone calls (positive correlation). Analyses were conducted using R version 2.15.2 (R Foundation for Statistical Computing, Vienna, Austria; www.R-project.org). A P-value <.05 was considered statistically significant for all analyses. This study was approved by the institutional review board at Oregon Health & Science University. At the beginning of the study period, panel sizes ranged from 5,915 (clinic 3) to 15,444 (clinic 4) and increased to between 9,425 (clinic 3) and 19,058 (clinic 4) by the end of the study period (Figure 1). The analyses described below adjust for these changes in panel sizes when estimating rates of MyChart messages and incoming phone calls per 1,000 patients each month over a 5-year follow-up period. Monthly trends in patient panel sizes per clinic between February 2009 and February 2011. Clinic 1 is a commercial community-based health center, clinic 2 is a university-based health center, clinic 3 is a rural health center, and clinic 4 is a federally qualified health center. In February 2009, 25.1% of patients at clinic 1 had active MyChart accounts (ie, accounts that had been activated by an activation code given to the patient after a visit and that were had not deactivated during the study), whereas 43.9% had active MyChart accounts at clinic 2. When clinics 3 and 4 implemented their patient portals in July 2011, 9.7% had active accounts at clinic 4, whereas only 2.4% had active accounts at clinic 3. At the end of the study period in June 2014, these numbers were up to 72.6% at clinic 1 and 71.7% at clinic 2, but only 39.1% at clinic 4 and 21.2% at clinic 3. Table 1 shows that MyChart message rates per 1000 patients ranged from 43 (clinic 1) to 182 (clinic 2), whereas telephone rates per 1000 patients ranged from 439 (clinic 1) to 1002 (clinic 4) between the start and end of the study period. The resulting correlations between MyChart messages and incoming telephone calls for each clinic are shown in Figure 2. Clinics 1 and 2 both showed a positive correlation between MyChart messages and incoming telephone calls over the study period. This indicates that, contrary to the proposed hypothesis, as MyChart messages increased in these 2 clinics, incoming telephone calls also increased. There was moderate positive correlation between messages and calls for clinic 1 (r = 0.546; P < .001) and clinic 2 (r = 0.543; P < .001). Rates of MyChart messages and telephone calls were not significantly correlated for clinics 3 or 4 (r = 0.098, P = .560 and r = 0.069, P = .671, respectively). Correlation between monthly rates of MyChart messages and rates of incoming telephone calls per 1000 patients from each clinic between February 2009 and February 2011. Smoothed locally weighted scatter-plot smoother (LOESS) curves are presented to highlight the trend over time. Thick solid lines denote the observed monthly incoming telephone calls. Thick dashed lines denote the observed monthly MyChart messages. Thin solid lines represent the smoothed LOESS curves of monthly incoming telephone calls. Thin dashed lines represent the smoothed LOESS curves of monthly MyChart messages. Smoothed LOESS curves are created by a locally weighted regression fitting technique that provides a generally smoother curve. The Spearman correlation coefficient is denoted by r and the P value for significance testing is denoted by p.
This study shows evidence that increases in patient-to-provider electronic messaging are positively correlated with increases in patient telephone calls at 2 of the 4 clinics. For the other 2 clinics, there was no indication of even a slight decrease in telephone calls. Our hypothesis that implementation and increased usage of a patient portal would be significantly correlated with decreases in telephone rates and thus the workload for a clinic is not supported by the observed data. While there may need to be a longer adjustment period after the adoption of an Internet portal for it to reduce phone call rates, there may be other potential benefits ranging from patient satisfaction to improvement of health. This result is both a surprise and important for clinics that are implementing patient portals. These results affect decisions about staffing of phones and the importance of having an effective workflow to respond to portal communications. This study was done during the same time that the clinics were implementing the patient-centered medical home model. A centerpiece of the patient-centered medical home is to engage patients in taking a more active role in managing their own health, which may have affected the number of communications that occurred. All 4 clinics were engaged in expanding their services to implement the patient-centered medical home ideals. They were implementing care coordination, panel management, and quality improvement around chronic illnesses, routine screenings, and vaccinations. Responding to communications such as reminders for tests or nurse checkups that originated from the clinics may have affected the volume of phone calls, especially for patients who did not have an active MyChart account. Furthermore, only Clinics 1 and 2 had MyChart portals with the ability to schedule appointments. The current version of MyChart for all clinics is not set up to respond to the complex nature of office visit scheduling, such as the duration or type of office visit that the patient is trying to request. Because of the nature of appointment setting, it is often easier to schedule an appointment using real-time communication. This may mean that telephone calls are often driven by appointment scheduling. Further steps are needed to make a successful transition of appointment setting from telephone calls to patient portals. Other issues can often arise from an electronic messaging system. In addition to possible computer error messages, patients may feel the need to follow up with their doctor after an initial message has been sent. This may be the case at clinic 3, which seemed to have a decreasing rate of telephone calls up until it implemented MyChart (see Figure 2). This could be a result of patients following up their MyChart messages with telephone calls to the clinic. Patient variations between clinics were not available at the time of this study. Further investigation into the demographics and characteristics between all clinics would be valuable, since technological skills and computer access can vary greatly among different demographic populations.16 Furthermore, not all patients had active MyChart accounts at the time of this study, whereas most—if not all—are expected to have telephone access. The period of data collection for MyChart messages in this study may be too short to make any significant or meaningful conclusions. A longer study may be required to allow patients and physicians adequate time to adopt electronic messaging as a substitute for telephone calls. In addition, we could only collect portal and telephone data for 4 clinics in Oregon, which may not be representative of the larger population of clinics and might have inhibited our ability to do analyses of data before and after portal implementation or comparisons with matched control clinics. During this study, transformation in the model of care to promote all forms of communication was occurring simultaneously, and isolating the impact of MyChart implementation from all the other changes going on in the study clinics is difficult given this study design. Study clinics had been working on implementing patient-centered medical home principles during the follow-up period, and clinics expanded access to patients, which certainly may have affected the results of our study. However, 1 of the arguments for the implementation of portal communication is that it will reduce the need for patients to call the clinic. That does not seem to be the case based on the observed results of this study, but there may be other confounding variables that are occurring with the transformation that were not accounted for. Data for this analysis combined all incoming patient-to-provider calls, both those that were answered at the clinic and those that were abandoned. However, because of the nature of electronic messaging as it compares to telephone calls, there is not an equivalent form of unanswered messages. Other factors such as a shortage of office staff who simply could not respond to the volume of calls may have affected the increase in incoming phone calls. With this new form of communication, patients may have different expectations for MyChart messages than for telephone calls. A patient may expect to receive a quicker response when telephoning their physician compared with sending an electronic message. Taking that into consideration, multiple telephone calls could be expected from the same patient who is trying to reach their doctor, whereas only 1 MyChart message might be received in a similar situation. While it is easier to distinguish whether 2 MyChart messages correspond to the same initial query, it is nearly impossible to record details regarding whether a telephone call is related to a previous call. The ability to link related phone calls may reveal more of the influence MyChart rates have on telephone call rates. Furthermore, as with any new technological implementation, there is often a learning curve for both patients and providers. Patients who attempt to send an electronic message and receive an error message may resort to telephoning their clinic—counting as both a message and a call—whereas those whose call is unanswered may hang up and call back, counting as 2 telephone calls. This bias between telephone calls and MyChart messages was not able to be accounted for using the data at hand and is worth further exploration. As patients and physicians become more accustomed to electronic messaging, the number of repeated calls and MyChart-induced telephone follow-ups may start to decrease. Health care organizations must look to other benefits of implementation beyond the hope of reducing phone communication, such as improving patients' education regarding their medical conditions and treatments,17 improving the accuracy of health care records by allowing patients easy access to them,18 and giving patients a sense of empowerment around their health care.19 The decision to adopt an Internet-based patient portal involves a major paradigm shift for health care organizations. As technology becomes increasingly integrated with health care, study of the benefits and effects of Internet-based patient portals will be an important area of research. While practices are increasingly making the decision of whether to implement a patient portal as part of their system of care, it is important that the motivation behind such a change be accurate. Health care organizations that adopt Internet-based patient portals with the hope of relieving clinical workload may experience frustration if the desired result does not occur. It is important to understand why the ability to send patient-to-provider messages via the portal did not decrease the number of incoming telephone calls. Received for publication December 1, 2015. Accepted for publication May 31, 2016. HITECH Act enforcement interim final rule. Health information privacy website. Washington, DC: Office for Civil Rights Headquarters, US Department of Health & Human Services; 2013. Available from: http://www.hhs.gov/hipaa/for-professionals/special-topics/HITECH-act-enforcement-interim-final-rule/index.html. Accessed March 4, 2015.
. Patient portal implementation: resident and attending physician attitudes. Fam Med 2013;45:335–40.
. Use of an electronic patient portal among disadvantaged populations. J Gen Intern Med 2011;26:1117–23.
. Patient-perceived usefulness of online electronic medical records: employing grounded theory in the development of information and communication technologies for use by patients living with chronic illness. J Am Med Inform Assoc 2005;12:306–14.
. Patient-physician web messaging. The impact on message volume and satisfaction. J Gen Intern Med 2005;20:52–7.
. Electronic patient–provider communication: will it offset office visits and telephone consultations in primary care? Int J Med Inform 2005;74:705–10.
. An Internet-based patient-provider communication system: randomized controlled trial. J Med Internet Res 2005;7:e47.
. The Kaiser Permanente Electronic Health Record: transforming and streamlining modalities of care. Health Aff (Millwood) 2009;28:323–33.
. Association of online patient access to clinicians and medical records with use of clinical services. JAMA 2012;308:2012–9. Epic Systems Corporation. Software. Mobile applications and portals. Available from: https://www.epic.com/Software#PatientEngagement. Accessed March 9, 2015. Epic Systems Corporation website. Available from: https://epic.com/About. Accessed March 9, 2015.
. How the integrated Epic EHR/PM system handles reporting. Available from: https://ehrintelligence.com/news/how-the-integrated-epic-ehrpm-system-handles-reporting. Avaya Inc. Avaya Aura Call Center Elite. Available from: http://www.avaya.com/usa/product/avaya-aura-call-center-elite. Accessed March 9, 2015. Aceyus [homepage]. Available from: http://www.aceyus.com. Accessed March 9, 2015.
. Social disparities in internet patient portal use in diabetes: evidence that the digital divide extends beyond access. J Am Med Inform Assoc 2011;18:318–21.
. The effects of promoting patient access to medical records: a review. J Am Med Inform Assoc 2003;10:129–38. , eds. Crossing the quality chasm: a new health system for the 21st century. Washington, DC: National Academy Press; 2001.
. Patient experiences and attitudes about access to a patient electronic health care record and linked web messaging. J Am Med Inform Assoc 2004;11:505–13. You are going to email the following Patient–Provider Communication: Does Electronic Messaging Reduce Incoming Telephone Calls? Re: Patient-Provider Communication: Does Electronic Messaging Reduce Incoming Telephone Calls?